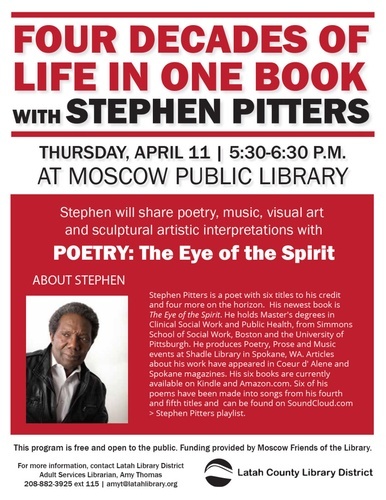 Community members are invited to Moscow Public Library for Four Decades of Life in One Book with Stephen Pitters. Stephen will share poetry, music, visual art, and sculptural artistic interpretations with POETRY: The Eye of the Spirit. Stephen Pitters is a poet with six titles to his credit and four more on the horizon. His newest book is The Eye of the Spirit. He holds Master's degrees in Clinical Social Work and Public Health, from Simmons School of Social Work, Boston and the University of Pittsburgh. He produces Poetry, Prose and Music events at Shadle Library in Spokane, WA. 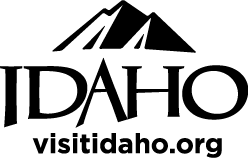 Articles about his work have appeared in Coeur d' Alene and Spokane magazines. His six books are currently available on Kindle and Amazon.com. Six of his poems have been made into songs from his fourth and fifth titles and can be found on SoundCloud.com > Stephen Pitters playlist. Funding for this event is provided by the Friends of the Moscow Library. Registration is not required. This free and fascinating library program is open to the public. For more information about this event, please visit the event section of our Facebook page, facebook.com/latahlibrary/.